Have you ever read a story and wanted more? Wanted to know what happened before and after the parts you read? For me, that was exactly what happened when I read the short story In Over His Head where I met and fell in love with Aiden St. John and Cade Martin. They were amazing and though I loved them I wanted to see how they got together and what happened after that trip to the family cabin. Well, Ms. Sherwood must have known this and she gave me exactly what I wanted. Exactly what I wanted. This was so different and yet so familiar. I know what happens at some point in the story but this felt so fresh and new. 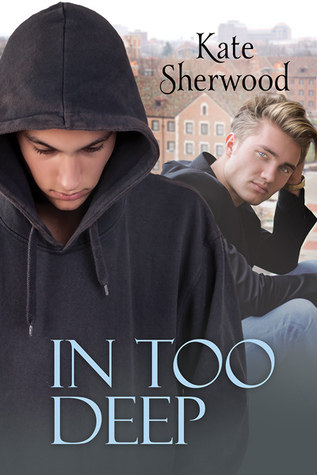 Meeting Cade and Aiden before they are Cade and Aiden as a couple was one big angsty swoon fest. Getting Cade’s POV first was great, we know why he is so reserved and what his goals are even thought the golden boy that is Aiden slowly gets under his skin. Cade’s struggle to not want Aiden was frustrating, but so damn sweet. And then there is Aiden. Good lord I love Aiden, everything about him. He wants Cade and tries so damn hard to give Cade everything including the space he demands but Aiden can’t stay away, until he has no choice. Ugh. The boys killed me with the angst and their budding relationship was a delightful slow burn. The small steps they took as friends was adorable and then the night when things move forward? It turned me into a big puddle of goo right at my desk and I decided work was less important than reading where this would go and when I would get to the story I’d read before. These two, I adored them with the short that inspired this story but I fell so hard for them with this. It was so damn good to see them become a couple and that whole exchange by the stairs with them in tuxedoes and Cade touching his shoulder while he stared at Aiden? Unf to that. I totally agree with Aiden, it was one of the hottest things I’d ever seen. But the angst, the hidden secret I know Cade has before he even mentions it kept my stomach in knots. Each time Cade gets closer to Aiden I know the drama that has to happen and I don’t want it to, not now when they are getting comfortable and falling for one another but… ugh. Reading this was a new experience for me, it was almost like reading a prequel to a story and yet, it wasn’t. Like I said before, this story was new and fresh and still the same but… I just loved it. I loved it and it was all that I could have asked for. It was more than I expected. I still felt all that Cade fretted over losing but this time, it was so deeply emotional because I knew all that he gave to get to where he was with Aiden. The time at the cabin? Blah. So completely fucked up and so completely surreal. Just so damn good. In Too Deep it can be read as a stand alone, you do not need to read In Over His Head to enjoy it at all. But for me, it was a special treat having read it, knowing about Cade and Aiden and getting what I wanted when it was done. I couldn’t be happier and more satisfied with this story. This entry was posted on March 12, 2015 by Sara in Contemporary, Reviewer: Sara, YA / NA and tagged 4 Stars, Dreamspinner Press, Kate Sherwood.